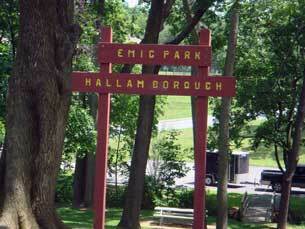 The Borough of Hallam was incorporated as a separate municipality in 1908. Prior to that time it was part of Hellam Township. 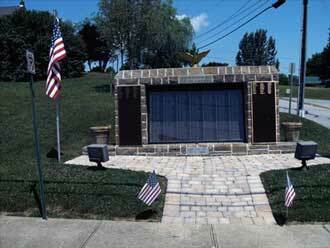 Near the center of the township, it is situated in the heart of Kreutz Creek Valley. In 1739, Samuel Blunston, a Quaker, became an agent for the Penn family and granted permits for land to settlers who located west of the Susquehanna River. Mr. Blunston was born in the township of Upper Hallam, in the County of York, England, after which Hallam was named. The winding stream which drains our fertile and historic valley, is now known as Kreutz Creek, which seems to be a corruption of the word "KREUZ", meaning "cross", for the place where two streams come together to form a "cross". It is mentioned in legal documents at the time of early settlements and for nearly half a century later, as Grist Creek and the valley as Grist Valley, after one of the first English settlers, John Grist who located near the head of the stream as early as 1719. Other information shows that the creek may have been named after George Kreis, an early settler on the creek. One of the factors leading to the concentrated settlement of the Hallam Borough area was water from the north branch of Kreutz Creek. Two of the earliest rural Germanic structures in York County, the Dietz and Schultz houses, erected in the 1730's, are located in the Borough. About 1855, tobacco growing became a profitable business for the Hallam farmers. As a result of the success of cultivating leaf tobacco, the cigar manufacturing Industry began in Hallam about the same time. A cigar factory was located at 277 E. Market St. This building later became a potato chip factory, and is now an apartment dwelling. The Pennsylvania Railway Station was situated a half mile from town, at the south end of Broad Street; just inside today's Borough limits. A mill was also located in this same vicinity. After the railroad was abandoned, the station was salvaged by Richard Dietz and moved to Its present location on the north side of Cherry Avenue, just west of the flrehall. Gradually the Borough became a nucleus of the southwest sector of the Township, the area in which most of the farms, mills, stores and ore pits were located. By 1880, there were about twenty structures In the Borough, generally located along Market Street. There were two hotels; one at 100 W. Market St. (presently owned by Miller's) and the other at 433-437 E. Market Street (presently owned by Townsley's). The town stable was located at 73 S. Broad St., currently York Valley Cheese Co. Allen Shepp's grocery store was located at 5 E. Market St., more recently Guy Keemer's Antiques, which is no longer in business. At one time there was a Blacksmith Shop at 136-140 W. Market St. Dr. Horning's office was located at 160-164 W. Market St. and Dr. Thorm's office was at 55 W. Market St., which later became the office of Dr. McHenry, an eye doctor. Jacob Dietz operated a tobacco factory in the long building at the rear of 483 E. Market St. In the front of this building, his wife operated a small grocery store and the house next door took in travelers. In 1918, the Hallam Furniture Factory was established at 310 S. Broad St.; later became Port-a-Crib. The Post Office was located on the corner of W. Market & S. Broad Streets. This building was later moved one lot to the east, presently occupied by Touch of Italy. A bank was then erected on the corner lot. Located on the corner of Church & W. Beaver Streets was the I. Lewis Cigar Factory. Around 1936, the Hellam Hosiery was established, but was sold to what Is now known as Susquehanna Micro. Jim & Nena's, located at 299 West Market Street, was welcomed to Hallam Borough in 2004. Numerous small businesses are presently located in the old factory building at 60 S. Prospect St., such as Fashions Unlimited, SMT Manufacturing and Susquehanna Rawhide. At present, the Borough stretches nearly a mile along Market Street, previously known as the York/Susquehanna Turnpike and later the Lincoln Highway. The completion of the York/Wrightsville trolley line in 1904 caused additional growth in population. Since completion of the Buttonwood Development in the southeast corner of the Borough, the population has more than doubled.